When a baby was born, friends of the family would do beadwork for the baby like baby boots, slippers, hats, and mittens. Beaded baby straps were made mostly by the grandmothers. It was like saying, “Welcome into our rich culture,” to give a baby beadwork. A baby belt supports a young child as she rides on her mother’s or sister’s back. This Gwich’in style belt has square ends and short ties. The beading is an “old style” open floral pattern on black velveteen. The beads are strung on sinew and tied down with thread. 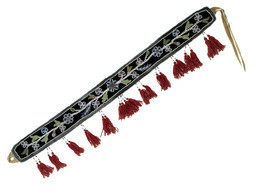 Beaded red wool tassels hang from the belt, which is backed with smoked moose hide. Judy Woods: That’s a baby strap. Eliza Jones: Let’s see, ts’uhneegaanh tl’ooł [baby string]. Judy Woods: Mm-hmm, ts’uhneejaanh tl’ooł [baby string]. Trimble Gilbert: This end of it right here [where it ties] is moose skin. Moose skin is strong, so it won’t bust. The other end is moose skin. Judy Woods: It’s moose skin on the back. Trimble Gilbert: Dahotthoo [brown, smoked] moose skin. I’ve seen a lot of people pack their baby [carry on their back]. Eliza Jones: It’s done on old-time velveteen [front material]. And again, a lot of really old, old patterns [bead work]. The beadwork is really old-time beads. The women today, they use a similar pattern, but the beads are different. Even this yarn [tassels] is an old-time yarn. You know, you wouldn’t be able to find this kind of yarn nowadays. And this cloth on the edge is different. Kate Duncan: It’s like denim or a twill. Eliza Jones: Twill, yes, that’s what that is. So it’s done on cloth, and then the backing is made of not too thick and not too thin moose hide so that it’s nice and sturdy. And these tassels are tied with sinew. And these beads [on tassels] probably are threaded with sinew too because they’re big. Yes, looks like it. Naagguye [trade beads], so these are called naagguye. Aron Crowell: What is different about the beads? Eliza Jones: They’re smaller, and they’re old-time beads. They don’t get the same kind of beads. Aron Crowell: How are they different than what you have today? Eliza Jones: Maybe Kate can tell you that. There are more seed beads today, and some of these here are cut beads. Kate Duncan: Some of it has to do with where they came from—whether they came from Czechoslovakia or Venice. The Czechoslovakian ones are unevenly colored. They often have a blue undertone, and they’re uneven in height. Did you notice the metal beads on here? Look at the points and in the middles. Kate Duncan: These look rusted, don’t they? Eliza Jones: They do. So they had metal beads? Eliza Jones: The round beads here [outside edge] are actually a different size than the flowers. The beads on the outside are a little bit bigger in size. Kate Duncan: Look at how tiny these [flower] beads are. They’re red and white inside. Eliza Jones: These were probably done [attached] with sinew. Kate Duncan: Because it was strong? Would that be why? Eliza Jones: The women a long time ago, they actually used sinew to sew the beads down. They had to make it real special. Judy Woods: That’s all they used to use a long time ago, because they didn’t have thread. Kate Duncan: It looks like these are strung on sinew, and then they’re tied down with thread. Eliza Jones: Oh, tied down with copper thread probably. Eliza Jones: It’s a continuous circle [beading on three petal, blue-red flowers]. That’s unusual. Kate Duncan: It goes like a figure eight, doesn’t it. Eliza Jones: Yes. Boy, my niece would just love to see this stuff. She’s really good at beadwork. Suzi Jones: Trimble, does anybody use baby belts anymore? Trimble Gilbert: They make them quite a bit, but they just sell them to the people. Judy Woods: They sell it, yes. Trimble Gilbert: But in Canada you see them, a lot of them are still using it. And I’ve seen it over at McPherson, when people gather up at the mountain. A lot of people still use this baby strap. Some are wider too. They’re beautiful. Suzi Jones: But not in Arctic Village [where Trimble lives]? Trimble Gilbert: Not in Arctic. You’ve probably seen the one at the Anchorage airport. Delores Sloan made it. It’s a good one. NMNH staff: Would men and women carry the babies? Judy Woods: Would you a pack baby on your back? Trimble Gilbert: Yes, I do that every once in a while. And a lot of people use it over in Canada. All of them wear slippers too. On this side, we’re too modernized. 2. According to Gwich’in translator Hishinlai’ “Kathy” Sikorski, dahotthoo [brown, smoked] refers to the process for tanning a hide.